Corel Photo-Paint is the image-editing program included in the CorelDRAW Graphics Suite, and it’s a reasonably full-featured photo-retouching and image-editing program. 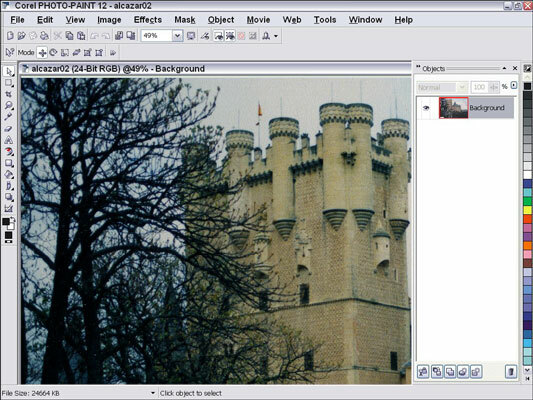 Photo-Paint (see this figure) stands solidly among a second tier of products for working on digital photos. You can edit your digital photos in Corel Photo-Paint. Plenty of tools: Photo-Paint offers a full set of selection, retouching, and painting tools for manual image manipulations. Automated commands: It includes convenient automated commands for a few common tasks, such as red eye removal. Part of the CorelDRAW Suite: Its greatest strength is its integration with CorelDRAW and the rest of the Corel Graphics Suite. If you use CorelDRAW to create and edit graphics, you’ve probably got Photo-Paint installed on your computer, and you’ll feel right at home using the product. Not available on its own: Photo-Paint is available only as part of the CorelDRAW Graphics Suite. At $400, CorelDRAW Graphics Suite is a good value, provided you need the main CorelDRAW program and any of the other components of the suite. However, $400 is a lot to pay for Photo-Paint alone, especially because other image editors are available for around $100. Favors Windows PCs: You can find versions of this program available for both PCs and the Mac, although the Mac version is several releases behind and might be difficult to locate.